Prairie Creek Redwoods State Park was one of the last stops on our epic road trip. 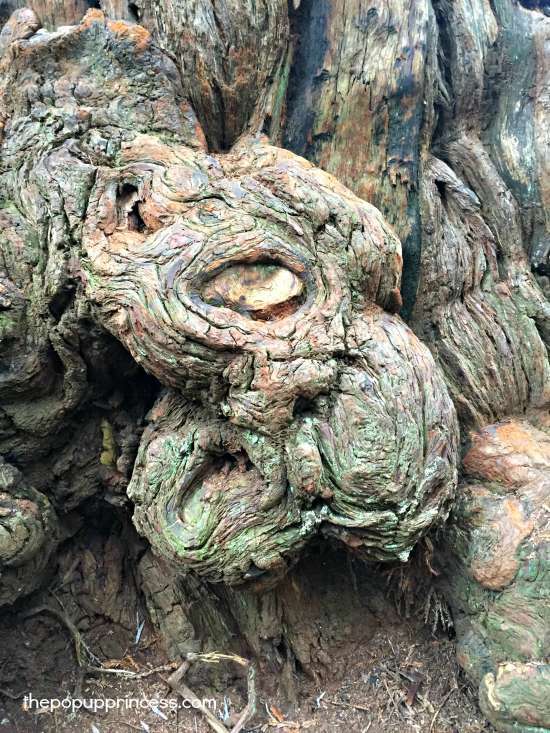 We had visited the coastal redwoods a few years ago, and we loved them. Last time, we only went as far as Eureka, California, though. This year, we wanted to visit a little further north, so we began looking at the Klamath area. 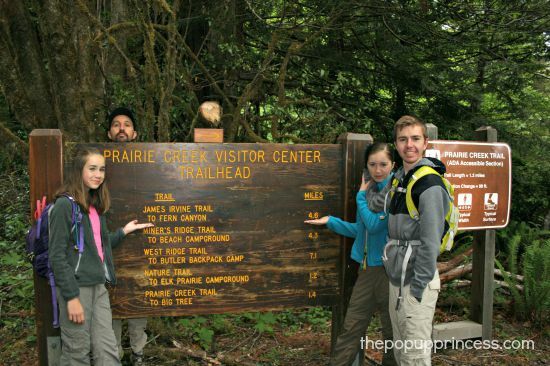 We had heard great things about Elk Prairie Campground, so we booked a campsite there. It was a pretty long drive from our last stop, so we broke the trip up a bit. 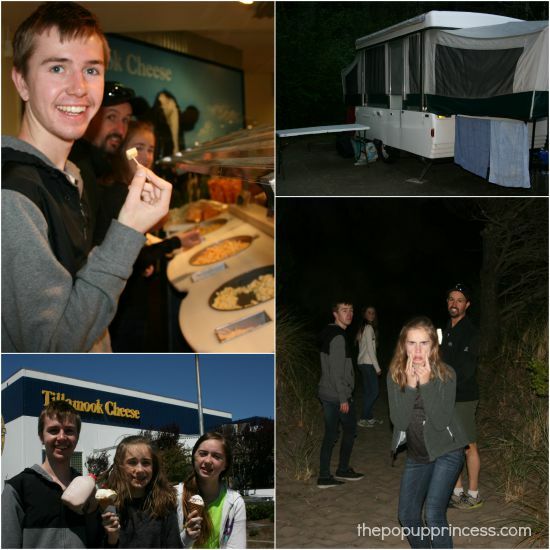 We drove from Astoria to Bandon, Oregon and stayed at Bullards Beach Campground. It was a long drive, and I think we were all affected by a few too many days on the road. 😛 It was one of the less pleasant drives of the trip… and I don’t know why, because the Oregon coast was gorgeous. I think we tried to drive too much in a short amount of time. We did stop and get a treat at the Tillamook Cheese factory. The kids loved that. By the time we pulled into Bullards Beach, it was dark, and we were a bit cranky. It was our first late night setup. Luckily, we had stopped in Coos Bay for dinner, so we didn’t have to mess with cooking. We were able to do a bare bones setup and head down the hiking trail to the beach. Bullards Beach was a decent campground with plenty of amenities, but we didn’t spend much time there, so I don’t have much of a review. We got up early the next morning and headed out to the redwoods. On our way to Elk Prairie Campground, we passed the Trees of Mystery in Klamath. 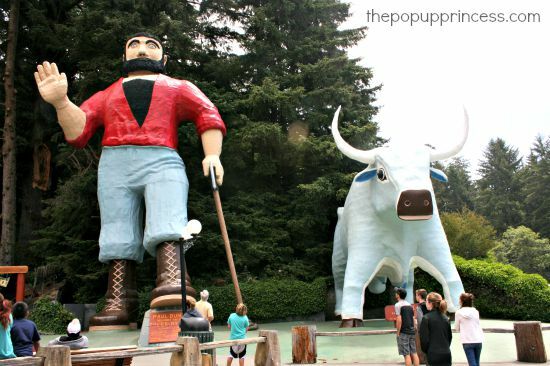 They have huge Paul Bunyan and Babe statues–Paul even talks. So we pulled over to check it out. Yes, it is very gimmicky, so we didn’t stay long. There was also a fee to use their trails, and we knew we would be able to use the trails near our campground anyway. Paul was kinda funny, though, and if you need to stretch your legs, it’s worth a stop. Smaller kids will surely love it. We checked into our campsite at Elk Prairie and set up camp. First, the not-so-good stuff… I have to say, California State Parks are a little on the expensive side. After visiting such wonderful state parks in Oregon, this was a little bit of a disappointment. There are no hookups at Elk Prairie–no electric, no water, no sewer. We don’t mind primitive camping, but I think the cost of the campsite should reflect the amenities. There were no dump stations at Elk Prairie either, but there were gray water drains under the couple of water spigots scattered throughout the campground. We were able to reserve our site in advance for $30/night plus an $8 reservation fee. I would highly recommend reserving your site in advance, as this is a popular campground. It fills quickly. Now on to the good stuff… The campground is beautiful. This is one of the prettiest campgrounds we’ve stayed in. You absolutely cannot beat the scenery. 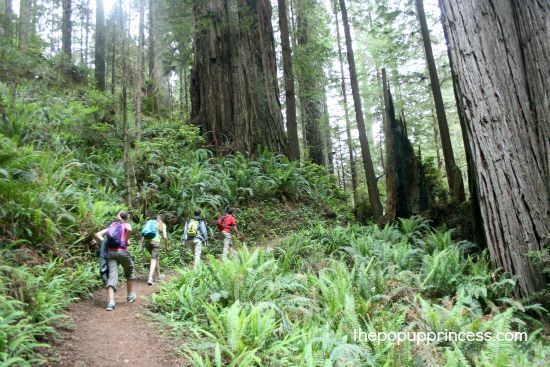 The campsites are nestled in the redwood trees, and there are hiking trails that start right near the campground. The sites are fair sized, and we had more than enough room to spread out. This is bear country, so be prepared to use a bear box. We didn’t see any bears during our stay, though. There is a small herd of elk that makes its home on the outskirts of the campground. We were able to watch them grazing from a safe distance during the late evening hours, which was pretty cool. Prairie Creek State Park is just a few minutes from Patrick’s Point State Park, which has rocky shores and some great tidepools. Our campground fees guaranteed us admission to the other state parks in the area during our stay. 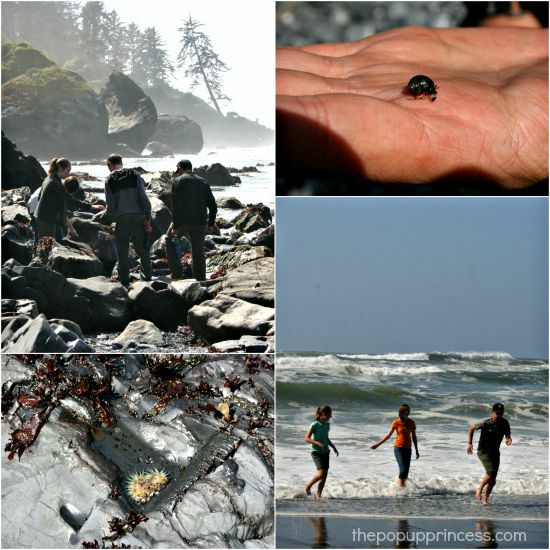 We took full advantage of that and headed down to Patrick’s Point to check out the tidepools and play in the waves. The kids had a blast looking for marine life and agates (they are supposed to be plentiful there). Both PopUpGirls love the beach and will play in the waves any chance they get. It was a nice little break. We also drove into McKinleyville (about 45 minutes away) to do some laundry and grocery shopping. Errand day is never fun, but when you are on the road for weeks at a time, it is necessary. This scenery is almost unbelievable. We meandered through old growth redwoods and tall, green ferns. We crossed over a few wooden bridges with babbling brooks underneath. Even though the park was packed, we saw very few people along the way. It was so peaceful. The kids didn’t even complain about the distance. The James Irvine Trail ends at Fern Canyon. 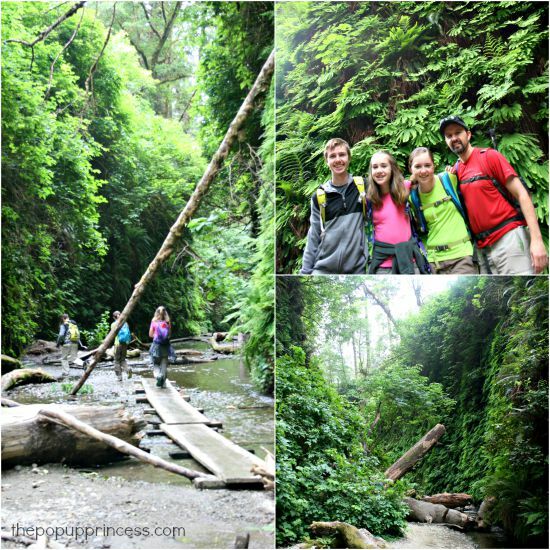 You have probably seen Fern Canyon at some point. This is actually the spot where parts of Jurassic Park II were filmed, and it does feel a little prehistoric in there. Because it is so beautiful, it is also very popular. Here’s where we encountered the crowds. You can also access Fern Canyon by car, and there is a parking area nearby. This meant that there were quite a few people making their way through the canyon when we arrived. We explored the canyon a bit and hiked out to the parking area. There are vault toilets there, which we were all thankful for. From the parking area, it is a short walk to Gold Bluffs Beach, so we headed down there to eat our picnic lunches. The beach was beautiful, but they allow vehicles to drive along the shores, so we were constantly dodging cars. It was a nice break, but not a stop I’d recommend for a day at the beach… especially with kids. 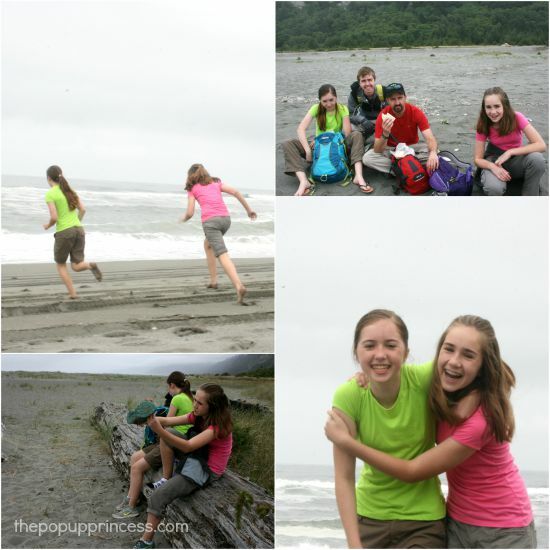 Once we’d had our fill of the beach, we walked back to the parking lot near Fern Canyon. 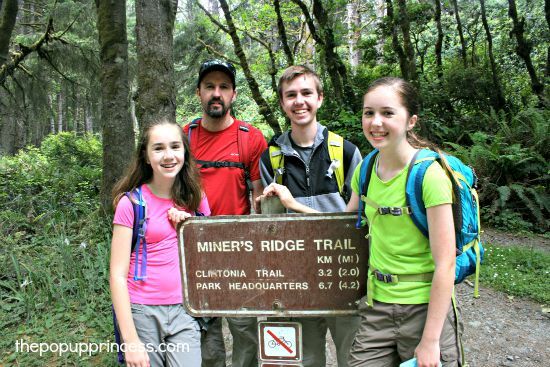 Instead of hiking back the way we came, however, we walked about a mile down the road to the Miner’s Ridge Trail. Alternatively, you can hike along the beach, however, both rangers we spoke with mentioned that the trailhead was a little hard to spot from the beach. We didn’t want to risk it, so we took the dirt road. It wasn’t a pretty walk, and we got sprayed with dust from passing cars several times, but the payoff was amazing. The scenery on this side of the park was a little different. 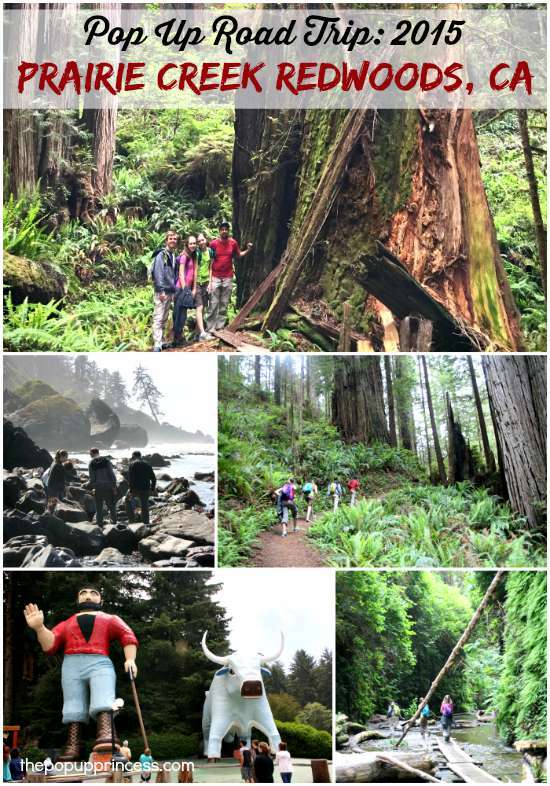 The beginning of the Miner’s Ridge Trail was more coastal pine trees than ancient redwoods. We passed the old miner’s camp, and eventually re-entered the old growth redwoods. 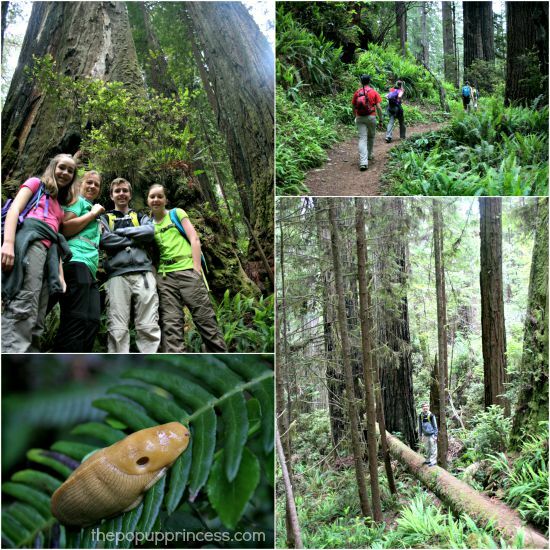 We saw our first banana slug, and hiked along some gigantic, gnarled redwoods. About halfway home, the distance started to catch up with us. We were all pretty tired and had eaten all of our snacks. That is a fatal flaw with PopUpGirl #2, who has to be coerced into hiking, anyway. 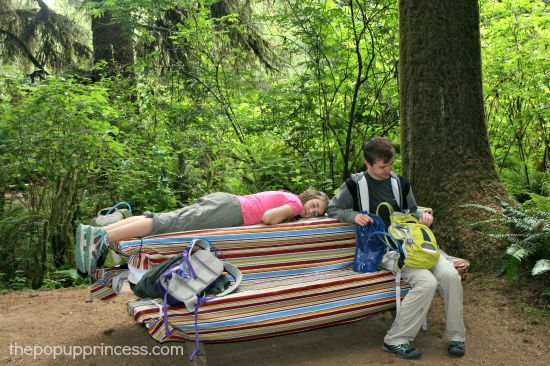 Apparently, we all have our limits–even when hiking in one of the most gorgeous places on Earth. 😛 The GPS says we logged 14.2 miles that day, but all I know is that the kids were exhausted when we finally hit camp. We got cleaned up and fell into our usual evening routine–a fire, good food, and some music. We had to force the kids to stay up until 7pm, but by 7:15, they were sound asleep. I guess the combination of the day’s activities and the promise of the comfy camper beds was too much for them. There are several campgrounds in the park and surrounding area. We booked our campsite at Elk Prairie Campground. There are NO hookups, although potable water is available at several water spigots around the campground. There is no dump station, but gray water can be disposed of in gray water drains near the water spigots. Each campsite has a bear box, and all food must be stored in it at all times. We were allowed to store our toiletries inside the pop up camper–at our own risk and as long as they were inside a cabinet. We were also allowed to use the cassette potty without restrictions. No food could be stored in the PUP, though. There are miles and miles of gorgeous hiking trails. We had an amazing time exploring the park, but be sure to grab a map at the visitor’s center before you set out. We found that some trails and intersections weren’t always clearly marked. Our map was a lifesaver. Our particular site wasn’t very level. Make sure you’ve got some sort of leveling system, and be prepared to take a little extra time getting the camper set up at the campsite. 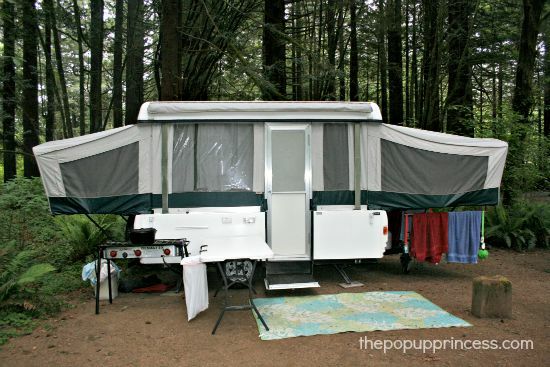 Have you stayed in the redwood forest area with your pop up camper? Feel free to share your experiences and favorite campgrounds in the comments section below! too bad you didnt go up the trail at Trees of Mystery, that’s the whole point. It’s very cool. I have enjoyed reading about each of your stops on your 2015 trip. You made some great memories with your family. Don’t be too sad though about them growing so fast, they will always remember these great times together and hopefully will pass along those traditions you created to their own families. And when they have moved out, you will have time alone with the Mr., but who knows? Maybe several years down the road you’ll have grand kids going with you! My friend & her hubby are at that stage. Their married daughter now sometimes goes with them on trips and brings the little grandbabies! I really enjoy reading your vacation adventures, and the info about the campsites is very helpful. I have so enjoyed reading about your trips, and I’m positive your children will always treasure their memories, good and bad. We have gone full circle. 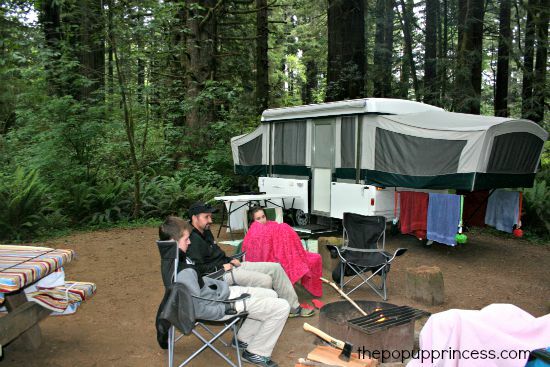 We started out in an Apache pop up when our kids were young and camped all over the mid-west and Southeastern coast. They are all grown and still camp with their children. We didn’t camp for years, but have just purchased a 2004 Fleetwood Sequoia Popup, We are now raising a couple of our grandchildren and we don’t want them to miss out on all of the fun memories. 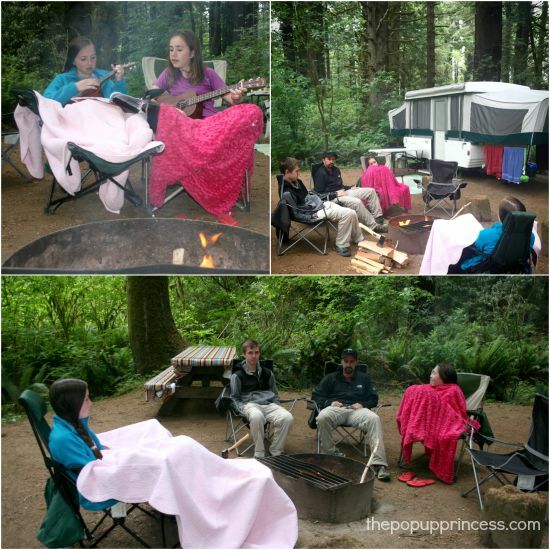 We have taken them “tent” camping a couple of times, with our grown children and several of their cousins, but that is just too hard for us now. BTW, your writings are not only interesting and entertaining, but quite informational. I really appreciated that. I’m sorry you didn’t get a good experience with Elk Prairie. My family loves it there, we’re actually heading back there next weekend. We never had a cold shower :/ and we do tent camping so hookups aren’t an issue for us. While yes the Trees of Mysteries is a bit campy it doesn’t have a lovely view especially when using the sky rail. You can see over all the trees in the area. I would suggest trying this little burger spot in Orick, it has some of the best burger I’ve ever had! 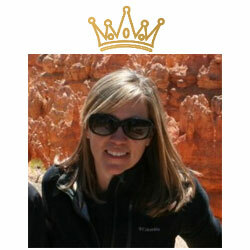 We loved many parts of Elk Prairie, Corine! We would definitely go back–the scenery was AMAZING! I just think that we were spoiled after camping in Oregon State Parks. California State Parks could learn a thing or two from them. 😉 But I didn’t want you to think it was a terrible experience, because we had a great time!